The Junta 42 has published their annual (and last) list of 42 top content marketing blogs. 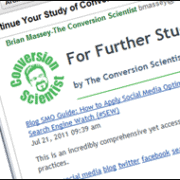 The Conversion Scientist is #24, and honored to be among some great sites. We have been following most of Junta42’s top 10 including Convince and Convert (#1), Top Rank (#2), Brian Solis (#3), Marketing Experiments (#5), Copyblogger (#6), Social Media Examiner (#7), Heidi Cohen (#10), and Duct Tape Marketing (#14). We are actively exploring the others, and you should too.